6 Are not five sparrows sold for two pennies? And not one of them is forgotten before God. 7 Why, even the hairs of your head are all numbered. Fear not; you are of more value than many sparrows. I read a story that I wanted to share. A well-known speaker started off his seminar by holding up a $20 bill. In the room of two hundred, he asked, "Who would like this $20 bill?" Hands immediately started going up. "I am going to give this $20 bill to one of you but first, let me do this." He proceeded to crumple the dollar bill up. He then asked, "Who still wants it?" Still hands were up in the air. "Well," he replied, "What if I do this?" And he dropped it on the ground, spit on it and started to grind it into the floor with his shoe. He picked it up, now crumpled and dirty. "Still want it now?" Surprisingly, hands still didn't go down. "My friends, I think we've all learned a valuable lesson here. 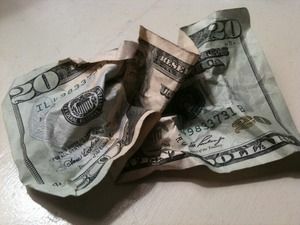 No matter what I did to this money, you still wanted it because it did not decrease in value. It was worth twenty whole dollars no matter what I did to it." "Often in our lives, we are dropped, crumpled, spit upon and ground into the dirt by the decisions we make and the circumstances that come our way. We feel as though we are worthless. But here's the kicker. No matter what has happened, we will never lose value in God's eyes. To Him, dirty or clean, crumpled or finely creased, we are still priceless. The worth of our lives does not come in who we are but by whose we are! Let's give our lives back to the Lord today, our disappointments, our suffering, our feelings of worthlessness. He is the God of healing. He has made us clean and worthy of our calling in Him! Dear Lord, thank You that we are valuable no matter the condition we are in. Help us never feel worthless. In the Name of Jesus, Amen.